As we made plans for our wedding and honeymoon, we picked the theme of renaissance. Our wedding was held at the school where we first met and was inspired by renaissance and neoclassical architecture and motifs; our honeymoon was inspired by places undergoing their own renaissances: Dubai, an economic renaissance; Mauritius, a cultural renaissance; and South Africa, a social renaissance. It didn’t hurt that each of these places was incredibly beautiful. We explored the city’s beautiful beaches; dazzling souks and shopping venues; distinct neighborhoods, such as Deira and the Palm Jumeirah; and major attractions, including Dubai Creek, Dubai Marina, and the Burj Khalifa. The Palm Jumeirah, a man-made island shaped like the leaves of a palm tree, and the Burj Khalifa, the world’s tallest building, are incredible examples of engineering. Our most memorable experience in Dubai was dining at the world-renowned Burj al Arab hotel, which was designed in the shape of an Arabian dhow sail. Situated on its own man-made island and boasting the world’s largest atrium, everything about the hotel is grand, from its gold leaf archways and pillars to its marble floors cut from stone used by Renaissance artist, Michelangelo. 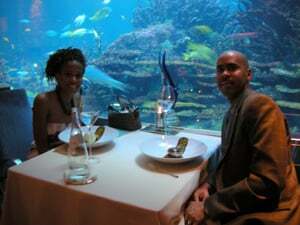 Dining in the Burj’s ultra-luxurious Al Mahara restaurant, watching exotic fish swim by and having several very attentive and knowledgeable staff assist us, made us feel like royalty. The menu selection was imaginative—Antoine ordered the Dover Sole Grenobloise, and I had the “Gold” Risotto, a dish that was made with real gold leaf! I couldn’t believe I ate gold leaf! The finale to our meal, an Ivory Sphere Tiramisu with berries and warm café noir sauce, was a sumptuous culinary masterpiece. After spending four days in Dubai, we headed to Mauritius to experience the islands of the Indian Ocean. How would l’île Maurice (the island of Mauritius in French) compare to the Caribbean that we have grown to love? For one, the people were among the friendliest people we have ever met, and like our Caribbean neighbors, Mauritius is a cultural mosaic of African, Asian, Indian, and European influences. However, Mauritius’ French and Afro-Asian “creole” blend has a certain “je ne sais quoi”. This uniqueness became even more evident in a cultural show we attended, where Mauritian women dressed in colorful, flowing garments performed several dances that resembled the movements of traditional Indian, Chinese, Middle Eastern, and African dances. They used props, such as candles and Chinese paper parasols for some of the dances. They also performed the sega, Mauritius’ national dance and music. In more recent times, sega has been influenced by reggae, resulting in a fusion called seggae. We learned about other cultural movements, such as coolitude, a concept created by Mauritian poet, Khal Torabully, but, of course, no island vacation would be complete without considerable time spent outdoors and at the beach! We certainly took advantage of the balmy weather. On a glass bottom boat tour offered by our hotel, we viewed the rich marine life supported by coral reefs surrounding the island and were able to see numerous colorful fish, gigantic reefs, unidentifiable sea creatures, and, even, a school of dolphins. We tested our skills at the hotel’s miniature golf course and discovered that we might need a few golf lessons. Throughout our stay, we were most content with unwinding under beach huts, sipping cocktails and soaking up sunrays. After four days in Mauritius, we flew to Johannesburg for a few days. There, we toured Johannesburg’s more well-known neighborhoods: Sandton, the Central Business District, Newtown, Hillbrow, Westcliff, and Soweto. These neighborhoods were very distinct, and the most memorable was Soweto. In Soweto, which stands for Southwest Township, we drove down several streets and through many neighborhoods, which were bustling with activity: children playing soccer, families walking to church, vendors selling crafts, etc. In a poor section of Soweto, we were saddened when we entered a one-room tin shack where a grandmother painstakingly cared for her four grandchildren. We stopped at the Hector Pieterson museum, devoted to a black youth who became an icon after being gunned down during the 1976 Soweto uprising against apartheid. We walked on the famous Vilakazi Street, once home to Nelson Mandela and Desmond Tutu. We had lunch at a local restaurant in Soweto, where we ate the best dish of our entire vacation: Malva Pudding! We tried Malva Pudding later in our trip, but the best was in Soweto. We also visited the apartheid museum, which was very moving and reminded us of the struggle for civil rights in the United States. 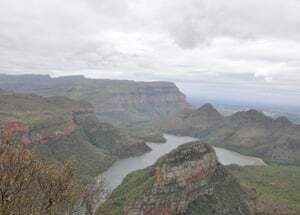 Upon leaving Johannesburg, we travelled on the Panorama Route, admiring the beautiful landscapes of Mpumalanga, including the Drakensburg Mountains, Bourke’s Luck Potholes, and the Blyde River Canyon. During our drive across South Africa’s countryside, we spent 3 days at the Sabi Sands Private Game Reserve in Greater Kruger National Park. We learned a lot about this reserve through watching the Animal Planet’s show, Into the Pride, where Dave (host) attempts to gain the trust of a rogue pack of lions by walking as close as the lions will allow and trying to show them that he is friendly. Doing that was not on our agenda! Our ranger and trekker were very skilled and made our game drives quite enjoyable. We snapped numerous photos of wildlife… lions and rhinos and hippos…oh my! We had adventurous bush walks and capped each game drive with sunset apéritifs and snacks. Mealtime was also adventurous—Antoine tried steenbok and wild boar, and one day at lunch, a feisty group of monkeys broke into a cabinet in the outdoor dining area and stole some bread, all while we and other guests were eating there. As we were surrounded by wild animals, we had to pay attention to our surroundings at all times and had to be escorted to our individual lodges after sunset. It was both spooky and exciting! Seeing animals in their natural habitat was awesome. One day, we encountered a herd of elephants that walked within in inches of our truck. We could have touched them—what an adrenaline rush! We saw a pride of lions, and it was amusing to see them interact with one another and mark their territory. One lion thought that we got too close and started roaring! This was about the point that our safari truck broke down…we started thinking of Dave from the Animal Planet…but luckily, there was another truck from our lodge nearby, so we were able to get a jumpstart. The giraffes were taller than we had envisioned and had this awkward elegance about them. We didn’t know how aggressive water buffaloes were; we were in awe of the size of rhinos; and we thought kudus were lovely animals. There was an abundance of smaller animals to see as well, and we became fascinated with the African eagle, dung beetle, and foam nest tree frog. Although we did not see a leopard, we saw an even rarer sight: wild dogs—there are only about 200 wild dogs in all of South Africa! In driving from Mpumalanga toward the Indian Ocean, we spent a night in the midst of mountains in the Ezulwini Valley of Swaziland. It was quite foggy but the smell of pine trees was refreshing. From there, we visited a Zulu cultural village where we learned the history and customs of the Zulu people. We ate traditional Zulu food, such as Madumbe (a cross between a potato and sweet potato), and Antoine sampled Zulu beer, which the Zulus make from maize, sorghum, water, and yeast. In Durban, we stayed near the ocean and remarked at its beautiful coastline. Due to Durban’s large Indian presence, several local dishes in Durban have Indian influence. One such dish we tried was bunny chow, made of hollowed bread and curry. It was definitely interesting! From Durban, we flew to Cape Town, a very picturesque city juxtaposed between mountains and oceans. The Mother City was our final stop in South Africa, a country where we retraced the steps of history and observed social progress toward equality and diversity. Robben Island was a memorable tour, and the boat ride to the island provided fantastic views of the city. Our tour guide, an ex-political prisoner, told us heart-felt stories as he walked with us through parts of the prison, including Nelson Mandela’s cell. We learned about prison life and the hardships of the prisoners—political prisoners were given worse treatment than criminal prisoners. Abundant beauty, artistry, and serenity describe Cape Town. We spent time wandering the city streets and the beautiful Victoria and Alfred Waterfront, picking up some souvenirs and African goods along the way. We dined at the Africa Café, a restaurant that serves pan-African delicacies in 12 to 15-course small portions. We enjoyed eating Ethiopian chic-pea bites and Kenyan irio patties among other dishes. After our meal, we were stuffed, so go there only when you are starving or you will not be able to eat all of the food! 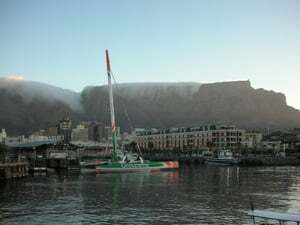 We visited the famous Table Mountain, with its marvelous, panoramic views of the city and surroundings. 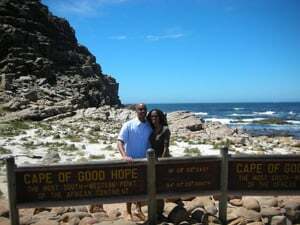 We explored the Twelve Apostles Mountains, Cape Point, and Cape of Good Hope, one of the most southern points on the continent of Africa. During our drive, we saw wild ostriches, elans, baboons, penguins and several remarkable views of distant shores.